When Anthony Pham read The New York Times’ expose about the exploitation of manicurists in New York, the California nail salon owner was at once horrified and comforted by how clear-cut the fix could be. After a 13-month investigation, which involved interviewing nail salon workers and owners across ethnicities and languages, The Times unveiled a laundry list of offenses, which included wage theft, physical abuse and the health consequences of being exposed to toxic products. While the expose shocked readers into boycotting nail salons, and moved Mayor Bill de Blasio into declaring a Nail Salon Day of Action on Thursday, advocates who have been addressing injustices like these for more than a decade have warned against taking drastic, and potentially harmful, steps. They say it will require coaxing workers out of the shadows, demanding more oversight among politicians and developing a trusting collaborative of nail salons, similar to a successful program in California. San Mateo supervisor Don Horshey present Spa Elysee with the Healthy Nail Salon award. This very concept of taking into consideration nail salon workers’ pressing needs has helped clean up the industry in California. "This Isn't About Boycotting Salons"
After Asian Health Services, a community health center and other advocacy groups took inventory of the health “epidemic” nail salon workers faced, they developed the California Healthy Nail Salon Collaborative in 2005. A conglomerate of manicurists, nonprofits, justice and environmental organizations, the collaborative aimed to develop a program that would reward salon owners for prioritizing workers' health and safety. Nail technicians are believed to have miscarriages, develop cancer and other conditions on the job due to exposure to toxins. The scrappy organization, which has only four full-time staff members, is also involved in community organizing and advocacy work on the policy level. One of the collaborative’s most effective measures was developing a healthy nail salon recognition program. In 2009, the group devised a three-part certification campaign that would earn participating nail salons a visible placard to place on the window, so that customers could feel confident knowing that the workers’ health isn’t being jeopardized. The program requires salons to dump any nail polishes containing the “Toxic Trio,” which is formaldehyde, toluene, and dibutyl phthalate. This move was particularly critical considering that repeated inhalation of such ingredients can be harmful, yet companies aren’t required to list the contents of their products on the bottle. The program also requires workers to wear protective gloves at all times and masks when they’re working with acrylics. Salons also must install ventilation systems, which vacuum out fine dust particles in the air. The air filtration systems cost about $800, but Pham was able to secure one for free since he was one of the first salons to get involved in the program. The county of San Mateo footed the bill and Liou hopes to get additional government funding to provide the system for any salon that wants to participate. The certification program, which is currently available in San Mateo, San Francisco, Alameda County, City of Santa Monica and Santa Clara County, was initially met with some skepticism. “People were very scared,” Liou said. “It’s going to be really expensive for us,” was a common concern she heard over and over. But what Liou uncovered over time was that most nail salon owners wanted to run ethically responsible businesses. But as is typically the case in New York City, the owners –- who are often immigrants just like many of their workers -- struggle with English and just didn’t have the information readily accessible to take the necessary steps. To ameliorate any concerns, the collaborative delivers a training packet that’s translated into a number of languages and holds a one-day seminar for every employee in the salon, so that everyone involved can fully grasp the protocol involved. Considering that his ventilation system was covered, Pham said the process wasn’t cost prohibitive. He estimates having spent about $300 on discarding old, toxic polishes and forks over about $40 a month for protective gloves and masks. To date, 55 salons have been certified. That figure is expected to climb to 75 by fall, Liou said. And while the recognition program doesn’t outright address wage issues, Pham noted that any salons that are eager to protect their workers’ health, likely aren’t interested in undercutting their employees. But getting paid paltry wages is also so much less of an overall concern in California, where nail technicians are mandated to undergo a rigorous 300-hour licensing process. A nail technician at Spa Elysee gives a customer a pedicure. Nail salons also undergo strict inspections two to three times a year. Those that are found guilty of violating of standard procedures are fined heavily and it’s “very, very easy” for a salon to have its license revoked, Pham added. While manicurists in New York are technically required to be licensed, The Times found that many simply work without them, and the licenses are easily bought, sold or forged. Taking on inexperienced workers was one of the oft-repeated justifications for not paying workers a living wage. The Times learned that workers often first pay about $100 to get in the door and then work for free until the salon owner deems them worthy enough to earn an hourly wage. Since manicurists are considered “tipped workers” in New York City, owners are permitted to compensate a little less than the $8.75 minimum wage. But many earn far less. One woman who was profiled got under $3 an hour. But Pham says that due to the extensive licensing process, pay is even more competitive in the industry. Employees just starting out at Pham’s salon earn $100 a day, and put in about nine hours. They keep all of their tips and earn a $10 bonus if a tech completes $300 in services. He said a “lower end” salary for a nail technician is a daily rate of $80 to $85. Pham said about 20 to 30 customers come through Spa Elysee’s door every day, where clients can also get waxing and facial services, but the salon doesn’t actually charge that much more than those in New York City. The average manicure in New York costs $10.50, according to The Times. Pham said he charges $15. A manicure-pedicure combination runs $30. While New York appears to have taken a page out of California’s healthy nail book, advocates say politicians needs to devote additional resources to make effective systemic changes. 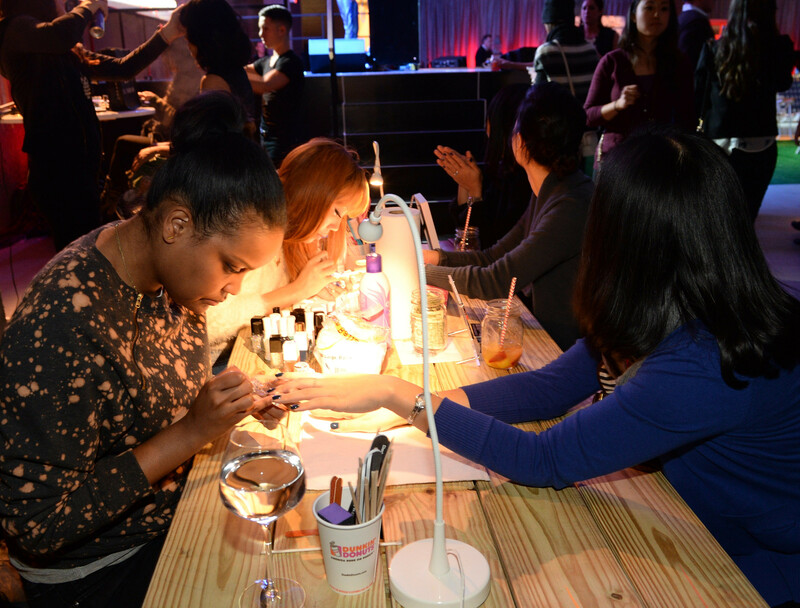 Spa Elysee hosts healthy nail salon event. The day after The Times piece ran, Gov. Andrew Cuomo implemented a number of emergency measures, which included requiring salons to post signs informing workers of their rights. They notify employees, for example, that it’s illegal to work for no pay and that they’re required to wear gloves to protect themselves. Hundreds of volunteers hit the streets on Thursday to dole out fliers further explaining nail salon workers’ rights. And while the agencies involved in the task force said they won’t ask workers about their legal status, advocates say part of the rehabilitative process needs to involve engaging with every worker, undocumented or not, in a meaningful way. Volunteers distribute flyers in multiple languages about health concerns, labor practices, regulations and wages at nail salons, to commuters outside a subway station in New York on May 21, 2015. On a federal level, advocates want to see toxic ingredients regulated for safety. In terms of what concerned customers do, advocates say they need to recognize the invaluable power of their voices. They say clients need to approach owners and ask about their tipping policies, breaks for workers and request the salon only carry non-toxic products, Yeung said. If customers notice something suspicious, they should contact a trafficking hotline and they should contact their legislators asking that their cities replicated California’s healthy nail salon program. This story has been updated to clarify the California Healthy Nail Salon Collaborative's healthy nail salon program.